Enter the new division of Monster Car Hill Racer and defeat all of the undead! Are you ready for the epic sequel of Monster Car Hill Racer? Monster Car Hill Racer is back for more, in this new and improved version you enter a whole new division of monsters, epic vehicles and monstrous weapons! 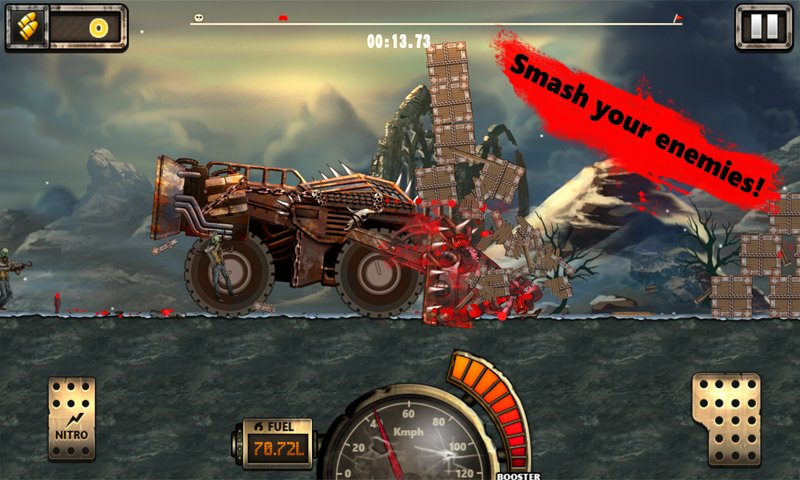 Can you defeat the fallen undead zombies with your Monster Car? Multiple modes for countless hours of gameplay! In the arcade mode, you are the only one left to save this monstrous world and hill climb your way to the castle of where the fallen undead zombies have their safe-haven. This new division of zombies are not easy to beat, use the winnings from every mission to upgrade your monster car to new heights! This hill climber is not for the feint of heart, so tread carefully! Endless Modes for more extreme fun! Next to the arcade mode, you’ll have access to our new endless mode, which will give you the objective to come as far as you can get. Try hard to beat your old score, or beat your friends using Google Game Services. See who is the best hill climber / monster killing race driver. If you’re up for even more challenges, Monster Car Hill Racer 2 has an epic Challenge mode which is even more difficult than the arcade and endless modes! Good luck Hill Climber! ▶ A new division of Monster Car Hill Racer! ▶ Upgrade your monster cars to new heights! ▶ Defeat all of the fallen undead zombies! ▶ Multiple game modes for even more fun! ▶ Beat this hill climber and become legend! - Reduced the amount of advertisment - Bugfixes in endless mode where you could not continue.